One thing is for certain. Emails containing Malware won’t be stopping anytime soon. 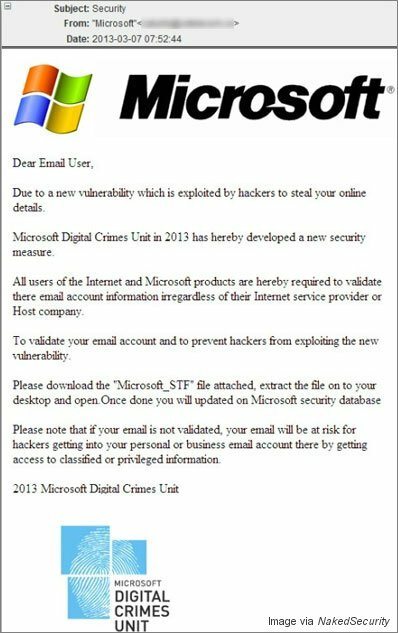 The newest unsolicited email to come into circulation is purportedly by Microsoft’s Digital Crimes Unit. The Malware developers (not Microsoft) convincing try to get unsuspecting users to run the enclosed attachment in order to validate their email address as part of Microsoft’s newly developed security measure. This email comes with the attachment Microsoft_STF_install.zip, which contains the TROJ/AGENT-AANA Trojan Horse. If you receive this email, DO NOT open the attachment. Simply delete the email instead. Email should always be treated with scrutiny. Verify the email – Check that the email is indeed intended for you, and not a handful of random people. Proofread the email – Often times, malware laden emails contain spelling or gramatical errors, or both. This is often a very good tip-off that something isn’t right. Qualify the email –Perform a google search on the email(s) in question. (ie. Microsoft Digital Crimes Unit email). You’d be interested with what you find. Often times these scams or phishing emails are already posted online as warnings to the general public.